This is, hands down, the most important election in Brazilian recent history. Haven't seen any exit polls, but if the last polls are trustworthy expect a second round between an openly fascistic candidate, Bolsonaro, and the Workers' Party (PT in Portuguese) and Lula's candidate Haddad. Maybe Ciro Gomes has a shot. The US and international media have been part of the problem, in all fairness, for the rise of Neo-Fascism. They suggest that Bolsonaro is not acceptable (like many in Brazil that have protested, pictured above), but they suggest that the Workers' Party is as dangerous and radical, but on the left of the political spectrum. Red scares continue to dominate the media decades after the collapse of Soviet communism. It's a bit tiring. Note that as I argued in many posts in the past the Brazilian situation is not the result of an economic crisis, fiscal or external. No real economic problem existed. It was, and it still is, a political crisis. Corruption exists, but it is also not the problem. That's what right wingers have used as a political instrument to counter their inability to win elections. The main cause of the political crisis is the result of the moderate improvement in social conditions and inequality during the PT administrations, and the backlash that this has caused in segments of the middle and upper classes. Interestingly, Dilma Rousseff, the impeached president, is not accused of anything and might have a shot at the Senate seat held by Aécio Neves, her rival in the last election, who is trying desperately to win a seat in Congress to avoid being prosecuted (contrary to Lula, that has been jailed as a result of someone saying he owned an apartment, without a single shred of corroborating evidence; Aécio is recorded asking for a R$2 million bribe, suggesting his cousin would pick it up, since it was a person he could trust and kill if he opened his mouth, and the cousin was later filmed and caught with the money). It is far from surprising that the Workers' Party is still in the dispute, and might win. Life conditions for the vast majority did improve in their governments (even if there is a lot to criticize in their policies). And they did win the last four elections. They are responsible for a frustrated right wing base that cannot win elections and resents social improvement. But the responsibility for the rise of Neo-Fascism in Brazil should all be placed squarely with the Brazilian Social Democracy Party (PSDB), the main alternative to PT, that failed to win elections since 1998 (20 years now), and to abide by the democratic rules when loosing. Besides, the justice system is now seen by many as a corrupted system itself, and the impunity of proven corrupts within PSDB has sapped their support within the middle and upper classes. 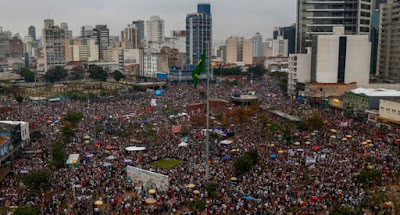 That empty space has been occupied by Bolsonaro, that claims to be anti-corruption, as Collor did back in the 1990s, and is probably all but. PSDB will probably collapse as the main opposition party after this election. And the middle and upper class are as a result left with a more radical and authoritarian alternative. In this respect, the Brazilian situation is not very different than the American one discussed by Michael Moore in his last movie Fahrenheit 11/9. Sure there are many reasons for the rise of Trumpism. But the elites in the Democratic Party have an important part in that rise. So-called liberals that did not respect democracy (e.g. the fact that all West Virginia counties went for Bernie, but Hillary got the delegates), or pushed and defended Neoliberal policies (e.g. the shocking role of Obama in the Flint catastrophe) were central to explain what happened (and more important than Russia). In similar vein, many PSDB intellectuals that had a lot of pride about their fight against the last dictatorship in Brazil, are co-responsible for perhaps helping lead to a new one (since many in the Bolsonaro camp, including him, have suggested they would not accept the results if they loose). Aécio was explicit about not accepting the results of the elections in 2014. And PSDB supported the coup, hoping to be able to win elections as soon as PT was tarnished as corrupt. From jail Lula has defeated them once again. Decent people around the globe now hope he can defeat Fascism too (if he has a chance). But the blame for this is all in the hands of the supposedly reasonable and well-behaved Brazilian Social Democrats. And the US media, by suggesting that PT is as despicable as the Neo-Fascists is helping them too. If Bolsonaro wins, you know who is to blame.